SIP Trunking - Trunking Technology | 8x8, Inc. 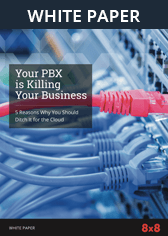 If you are experiencing high phone bills, paying for lines (or bandwidth) you don’t always use or have to connect multiple devices across multiple locations, you should consider switching to SIP Trunking to handle your communication needs. SIP stands for Session Initiation Protocol. It is a layer that sits on top of VoIP (Voice over Internet Protocol) that connects your phone calls and other data using the internet. What is SIP Trunking? Using multiple trunk lines, SIP trunking connects to public phone networks to handle calls or share data. SIP trunking can replace a traditional business phone line, and it can connect directly to the Public Switched Telephone Network (PSTN). This allows VoIP users to make calls to any phone on the PSTN without the need for telephone lines using a cloud-hosted PBX system. SIP technology handles the traffic for voice phone calls no differently than it handles the transmission of any data. To the system, video conferencing, phone calls, emails or sharing documents is all the same; it is all transferred as data packets. Since everything originates as a local call, there are no additional costs for long distance calls or streaming video behind your bandwidth costs and monthly SIP fees. What Are the Advantages of SIP Trunking? SIP Trunking has multiple benefits for your teams and work groups. By connecting all of them through unified communications across devices, you can cut costs and increase efficiency. It works across devices, including mobile, and can adapt the way it interacts to work with nearly any system being used. By sharing trunk lines, it can reduce the number of lines you need to handle call volume. Reducing the number of lines into just a single point for incoming calls dramatically reducing the cost and eliminates the maintenance of the lines. There’s no hardware, wiring or circuit boxes needed to physically connect your lines to the local phone company. If your company is experiencing high monthly phone bills, has a large number of incoming phone lines, racks up long distance charges and is limited to legacy equipment and technology, SIP trunking may offer a better solution. You pay only for the number of lines you need rather than being locked into a fixed number of lines or using only a portion of your bandwidth. You can either purchase Unlimited SIP trunking or a pool of minutes subject to overage charges. This eliminates wasted resources. In addition, there is a reliability built into SIP trunking that traditional phone services simply cannot match. If there is an emergency, a system failure or a lost connection point, SIP trunking providers will re-route your traffic to a redundant data line or forward calls to mobile phones to keep you in business. 8x8’s offers cloud-based solutions that can handle your business phone needs as well as integrating your additional mobile devices. By providing unified communications across platforms and devices, your team can efficiently interact with each other and customers on any device at any time in any way. Phone, meetings, conferencing, team messaging and contact center capabilities are all handled efficiently in a cloud-based network. These unified communications use pre-built APIs to allow apps such as ZenDesk, Netsuite and Salesforce to integrate into your system for easy access or sharing. It provides for a single data source across devices and systems for ease of analysis. 8x8 also provides security compliance certificates for FISMA (Federal Information Security Management Act), SOX (Sarbanes-Oxley Act) and HIPAA (Health Insurance Portability and Accountability Act of 1996).